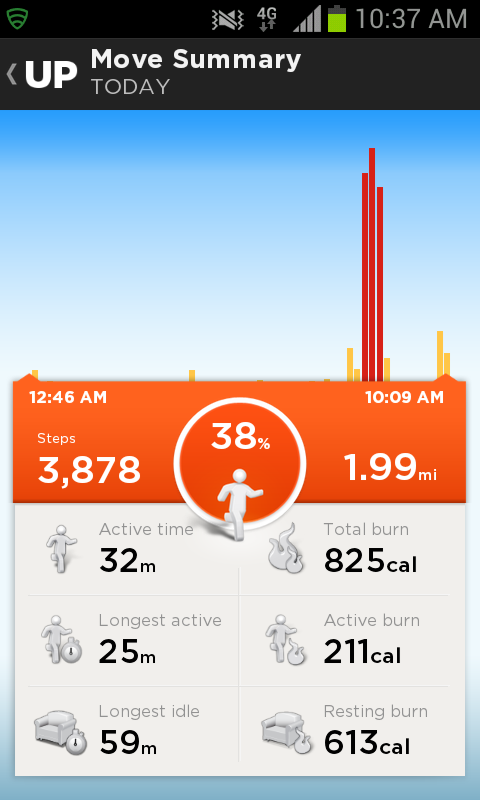 Last week, a friend of mine was telling me about her new Fitbit One that she was using to track her activity. We both have sedentary jobs, and due to weird work schedules (her own and in my case, my husband’s), meals were sort of sporadic. After doing some online research, I settled on the Jawbone Up rather than a Fitbit, although Fitbit also has a wristband tracker, the Flex. 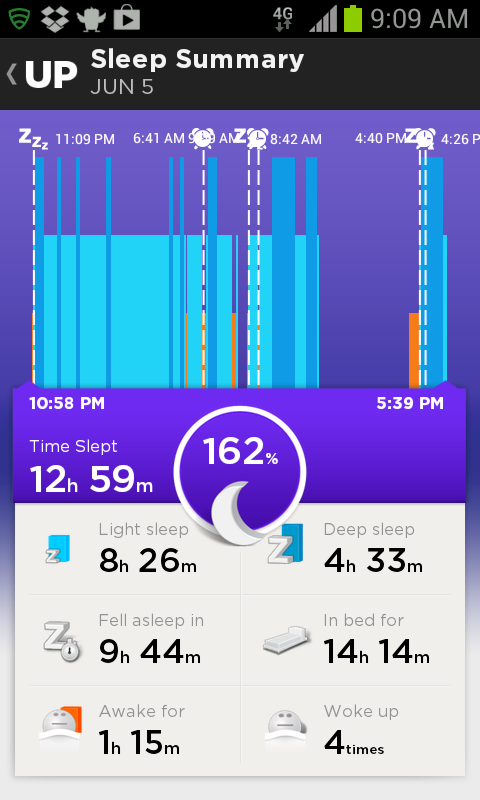 From the looks of things, the Up app software looked more useful to me, particularly in tracking my sleep, which I know is a massive problem for me. 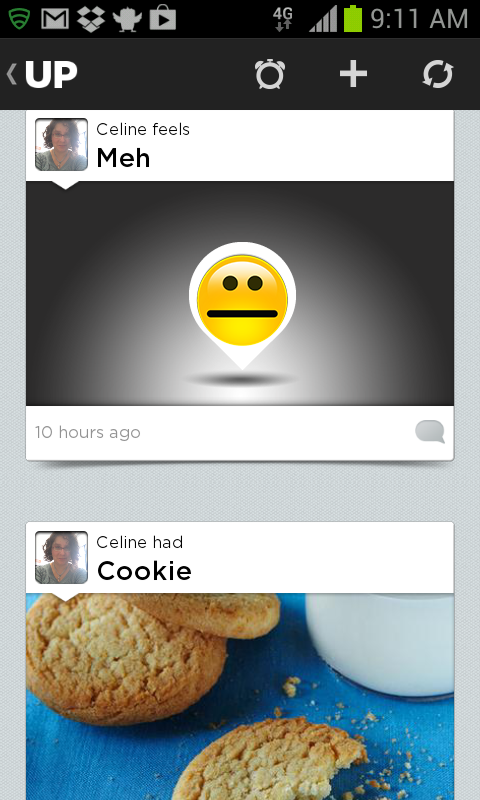 The Up’s Home Screen on the app. From left to right: Sleep, Movement, Food. Set-up from the box is pretty easy. Download the app, plug in your band using the headphone jack on your phone, and the start up wizard process walks you through set up. Some marked the Up down on its lack of wireless sync, but for me, the improved battery life is worth the trade off. Tip: sometimes the app will hang up while syncing – I’ve found this typically happens because the volume has been turned down. Turning it back up should allow the sync to complete. The materials included with the band are minimal – most of the information you need is going to be contained in the app, although the directions are not always as clear as I would like. For example, I’m a huge napper, so the power nap feature was very appealing – if only I could get it to work! Thankfully, google has been pretty helpful so far when I’ve run into a snag – some Up bands have a blue moon, rather than the green mentioned in the app, and in order to recognize different modes, you have to press the button fairly rapidly. So to enter power nap mode, hit the button three times fast, holding down on the last press. My Up, in mint green. When going to bed, enter sleep mode by holding down the button until the moon flashes. When getting up, do the same until the sun appears. Easy! The band on the Up is quite a bit thicker than the Flex, and it was one of the reasons I was worried about making my choice, but I got used to it quickly. I wear it on my non-dominant hand, though, because the one area it was obviously clunky was hand-writing. So how do the various tracking modes hold up? 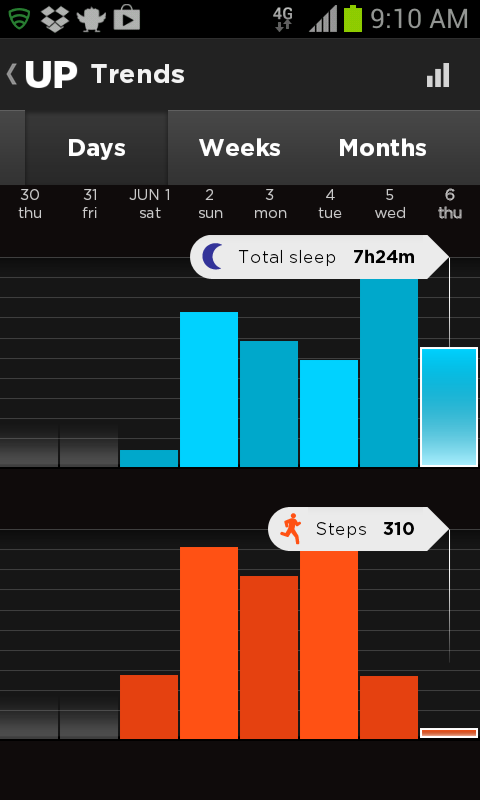 I like the detailed sleep tracker. The Flex only tracks when you wake up and when you sleep – but the Up tracks deep sleep versus light sleep, how long it takes you to fall asleep, and what times you wake up. It uses this info to run the smart alarm, which wakes you up in your light sleep mode prior to the time you set. If you’re sleeping deeply, it goes off at the time you’ve set. (For example, I’ve set my time for 7AM, and you can see my alarm went off at 6:41.) At the moment, there is no snooze feature, so if you’re not prepared to hop out of bed right away, you might want a back up alarm, just in case. You can also set up to four different times of alarm, so you can sort of build in your own snooze, as well. You can see the spike in today’s movement where I walked to work. It also tracks your idle time, your calories burned (I take this with a grain of salt, personal) and total movement time. Tying into this is the Idle alert feature, where you can set your band to vibrate after a certain amount of time where you’ve been idle. Mine is set at the lowest number, 15 minutes, and I use it to remember not just to move, but to stretch, or to drink some water. I found at even 30 minutes, I was getting up just enough during those times to check mail or use the washroom, it wasn’t going off enough to remind me to rest my eyes or stretch my legs. Trends: A comparison of sleep and movement. The trends page lets you see your sleep and movement on a daily, weekly or monthly basis. Not much data there yet! Food tracking – Don’t be alarmed by these numbers! 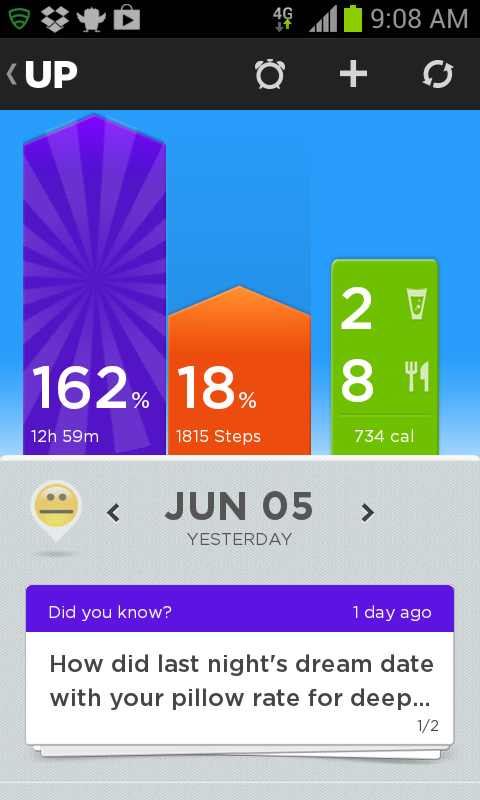 Meal summaries are maybe one of the failings of the Jawbone Up, which can be easily remedied with how it syncs with other apps, like MyFitnessPal. I am using mine strictly to track what I eat so I can easily identify patterns where things like sleeplessness or migraines are concerned. 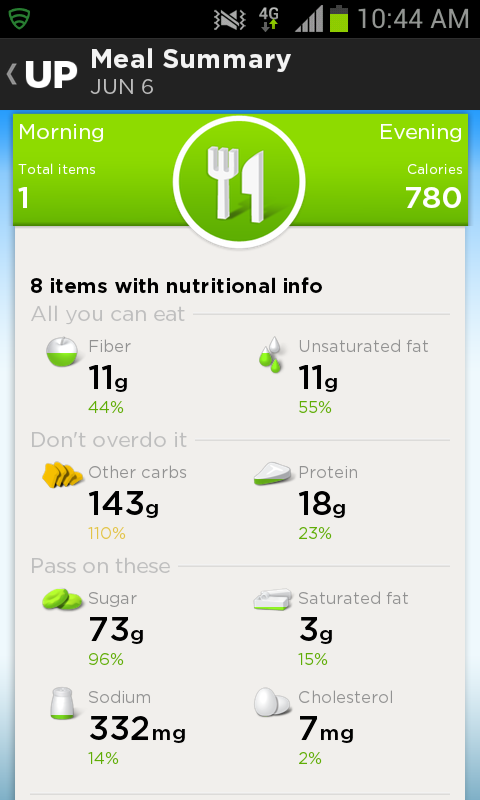 The database for food with the Up is somewhat limited, so you may prefer to use another app with their baseline to track food. That said, you can also add food to your own personal library to have things you eat regularly in an easily accessible list, as well. I feel this a lot! Another cute aspect of the app is the mood tracker. You can select it manually, or you can set up a recipe in If This Then That to set something automatically – for example, if I get less than 4 hours of deep sleep a day, it sets my mood to exhausted. There is a lot of exhausted in my timeline already. As I mentioned above, Jawbone does sync with other apps to work in tandem – MyFitnessPal is one, IFTTT is another (and obviously, one I use!). IFTTT is a neat one – in addition to the recipe above, I can have my phone send me a text if I haven’t logged a workout in X days. It can track your sleep and movement in a google drive spreadsheet for you. I personally really like this one. You can also create your own recipes. Up is an investment, and a pricey one at 129 CAD. I am lucky to afford the investment, and I’m glad it will give me solid data at doctor’s visits about how poorly I’m sleeping or eating, so we can continue to pinpoint what exactly is wrong with my gross bod. It’s a nice curiosity alleviator – apparently it’s ~7000 steps round trip from home to work, or I don’t wake up in the middle of the night as much as I thought I did. I can find out exactly how much you really do walk at Disney World. 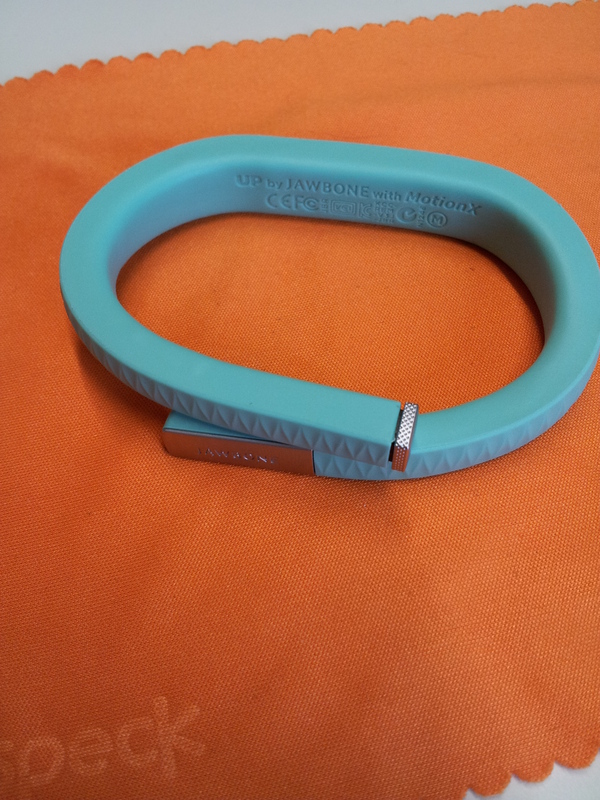 I look forward to seeing new updates from Jawbone and how far this band can go.